Late in the Second Empire period, Orsinium was briefly recognized as an Imperial province. 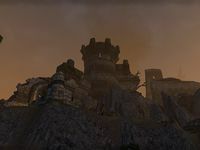 Frostbreak Fortress was built to help defend it, but was abandoned after the Second Empire collapsed and Orsinium was once again destroyed. Frostbreak Fortress is a fort found west-southwest of Orsinium. It is occupied by the Winterborn and their harpy allies, and is under siege from the Orcs of Orsinium. Frostbreak Fortress Objective: Disrupt the Winterborn's last stronghold in Wrothgar.